For the Grammar Police in your life. This necklace is available in copper or 1100 pure food grade aluminum tag(lightweight, durable and won’t irritate the skin). Copper pendant comes with a copper plated chain, aluminum comes with a sterling silver chain. Copper or Aluminum Pendant = 1" x 1/2"
Each necklace is stamped by hand, one letter and number at a time and will not be perfectly straight, which leads to its charming handmade appeal. No two will ever look alike! - Please refer to our Shop Announcement on the front page of our shop for our most up to date production time. It will fluctuate depending on sale volume, especially during busy holiday seasons. 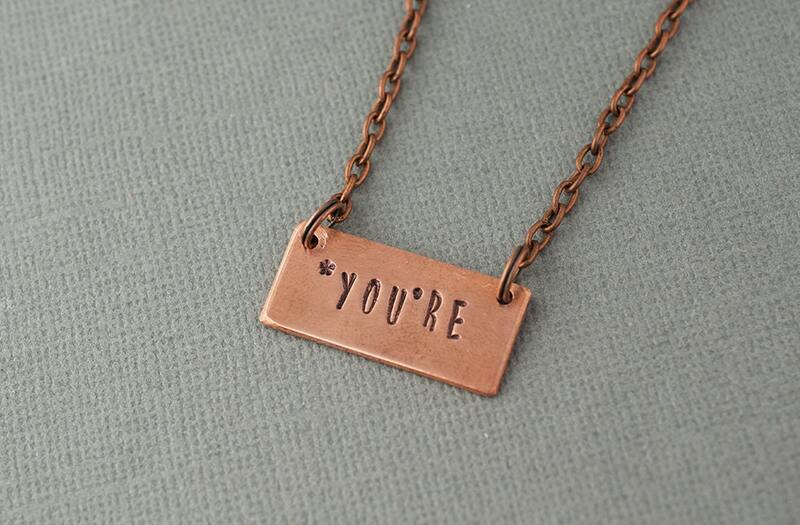 For more great hand stamped ideas, please visit the rest of our shop! :: We accept credit cards or e-checks through PayPal and credit cards through Etsy. Please ensure your payment is complete within three days of purchasing the item. ::Custom order pieces are non-refundable. Please triple check all spelling and wording prior to submitting your order. Any questions, please feel free to contact us. :: Please check our Shop Announcements section at the top of our main page for the most accurate production turn around times. :: Our current production turn around time for 'made to order' items is 1-2 weeks before your order is shipped out. Please plan accordingly. If you need it sooner, we will do our best to accommodate you if we can, so please contact us about expediting your order prior to purchasing. Thank you for your patience and continued support. :: Items are shipped through USPS First Class with Delivery Confirmation unless otherwise noted in the description of the item. If you need it sooner, please message us and we will set up a custom order to accommodate the upgraded shipping costs. :: Shipping is done M-W-F. Please allow extra time for custom hand stamped items, as these are made after an order has been placed. :: International shipping is available. We ship First Class International, unless otherwise requested. If you would like to upgrade to Priority or Express, please message us prior to ordering. International customers are responsible for ANY and ALL customs duty charges that may come up for your country. If you have any questions, please contact us PRIOR to ordering. :: Multiple orders will be combined to save on shipping costs.